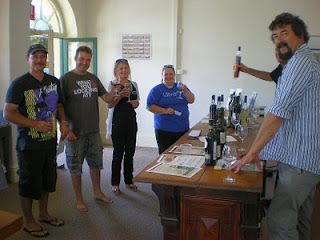 Karra Yerta Wines - Barossa Ranges Ramblings & Reviews: Challenges, trials and tribulations: Welcome to 2010! Challenges, trials and tribulations: Welcome to 2010! After a non-event Christmas and New Year period, this has been the first opportunity I have had to even consider updating my blogs. 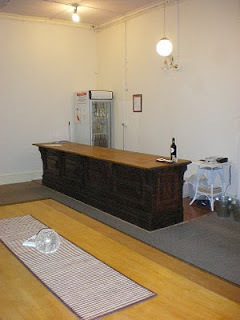 With my license application hiccups, my hopes of opening the Collective Barossa shop were delayed. A pre-Christmas opening date was impossible and a New Year one more-so as once we started the renovations on the lovely old room, it was apparent that it was going to take much more hard work and cash input than originally planned. However, it is worth it on looking at what a month of solid work achieved but more about that later. A spate of funerals prior to Christmas did not add any cheer to our Season and ironically, the trend continued with the notification of the passing of a close family member on my actual opening day at the shop so the long awaited day was indeed bittersweet. But back to the renovations for a moment. This entailed a great deal of work by an amazing team of dedicated and encouraging friends. One good fellow even travelled from interstate to help me in the final stages of painting last week (which sometimes ended at any time between 1 and 2 am!) I bet he will sleep well for the next week at least after his efforts now that he has returned home. Myself, well I feel like I could sleep for a week too but there's no chance of that as I still have a fair amount of finishing off and organising to do in any spare moments. January 1st was to be remembered for all the wrong reasons - a computer crash on our office computer - in the thick of trying to set up my second business. I am still trying to retrieve certain information and more importantly, get into the habit of backing information up but again, time is the key to that. And time is indeed, right now, my most precious resource. Heatwaves (and trying to paint and plaster in the midst), school holidays (busy at any time let alone when trying to set up a new business), vintage appearing to start (oh dear... already??) and a few health issues of my own have already made 2010 challenging. One can only hope that things will settle down in the coming weeks so that there is time to catch a breath and enjoy some of the good things that are around us, but patience will be needed I think. Despite the reward of finally opening the shop, there are still some tribulations that need to be addressed. 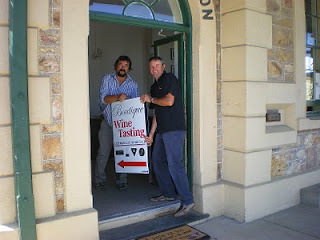 So, onto the positive news, and that is indeed that Collective Barossa is now officially open. Thanks to so many incredible people, too numerous to mention on here, our first day of trading in the shop was yesterday, Saturday January 16th, 2010. As it was also the Tanunda Hot Rod Show day we had a diverse range of customers and well-wishers and our first day was very successful. Steve Kurtz (Kurtz Family Vineyards) and Mark Mader (Gumpara Wines) were available all day to show and speak about their fine wines and the customers thoroughly enjoyed the experience. It was an incredible day and had we not received the news of the family death only an hour after opening our doors, we would probably still be smiling (and celebrating), if only from the relief that we actually made it - that after five solid months of hard labour, I could finally stand behind the counter and physically see that my dream had become reality. 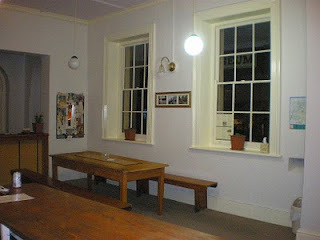 Collective Barossa is situated in the front room of the grand old Barossa Museum (47 Murray Street, Tanunda) and will be open seven days a week from 11am to 5pm. For more information on the shop you can go to the Facebook Page that I have set up here: http://www.facebook.com/pages/Tanunda-Australia/Collective-Barossa/170955857806 or to the Collective blog: http://collectivebarossa.blogspot.com/ which I will update as soon as possible, hopefully in the next day or so. In the meantime, just to whet your appetite, here are some photos from yesterdays opening and of the shop since it has been lovingly tended (it's still missing the curtains and more shelving behind the counter will be added shortly but all in all, it's quite impressive considering only a few weeks ago it was a pastel pink and spearmint green expanse with holes in the walls and plaster falling off).